I need to get back to blogging about my models. "Blue Parasol" was not on my "must have" list at first, until I started seeing pictures of her on the doll boards. 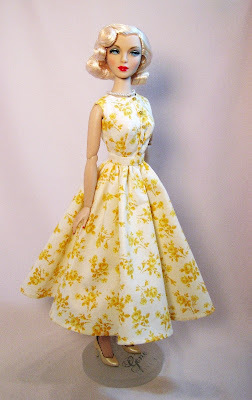 It was then that I realized she would be a great Grace Kelly and Marilyn Monroe model for the movie costumes that I like to recreate in miniature. It took me a while to find her, but she was worth it. She is one of my favorites, I love her. Gene modeling a dress by Paintbox. One of the very few fashions by another designer. My only issue with "Blue Parasol" is though she is gorgeous in person, she is one of my least photogenic dolls. For some reason, her eyes are very shadowed in some of her photos. I'm not the best doll photographer out there. I would rather spend my time sewing doll clothes than photographing them. I wonder if it is because her hair is so light and my camera doesn't like that there isn't much contrast on her face. I don't have this problem with my brunette dolls. Diane - For the dark eyes, part of it could be her hair; the curl on the one side causes a shadow, so unless you have a light compensating for that, her face can be darker. Putting a hat on the doll would make the problem worse. My "el cheapo" solution is to have an additional small lamp in one hand strategically held to blow out some of those shadows while I snap the camera with my other hand. I think it's because her eyeshadows are almost the same colour as her irise. Gene has really huge irises. They almost occupy the whites of the eyes. She looks good at 3/4 or at close up full frontal. I love the outfit with a "poncho like" hat. By the way, have you checked the latest Tonner Ava Gardner doll called "Hearts Ablaze" 500 LE? 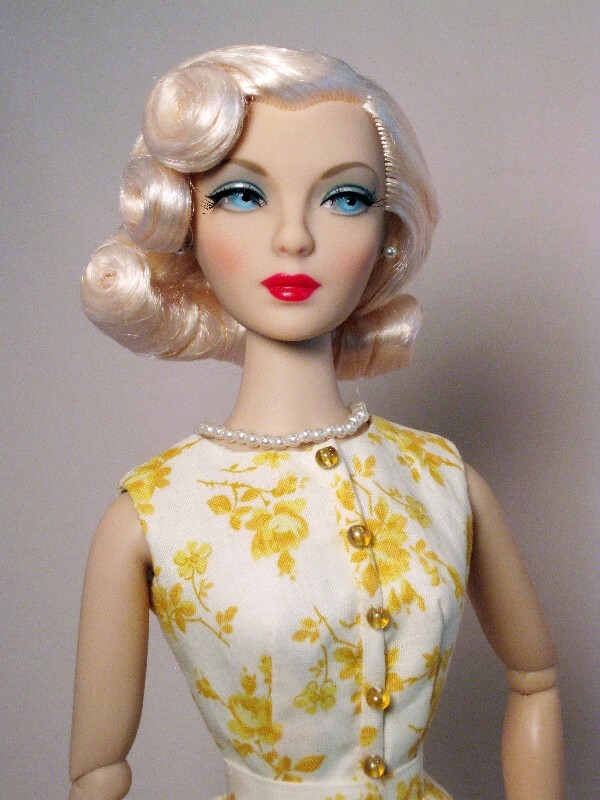 The doll looks so much like Ms Gardner, unlike the previous ones. I am ordering one at Cherish Friend website for USD$159.99. The doll will be available around March 16.